The quarterfinals for the Women’s NIVC are set after eight contests on Friday, including five set wins by Portland and UNLV. Action resumes Wednesday, Dec. 5. 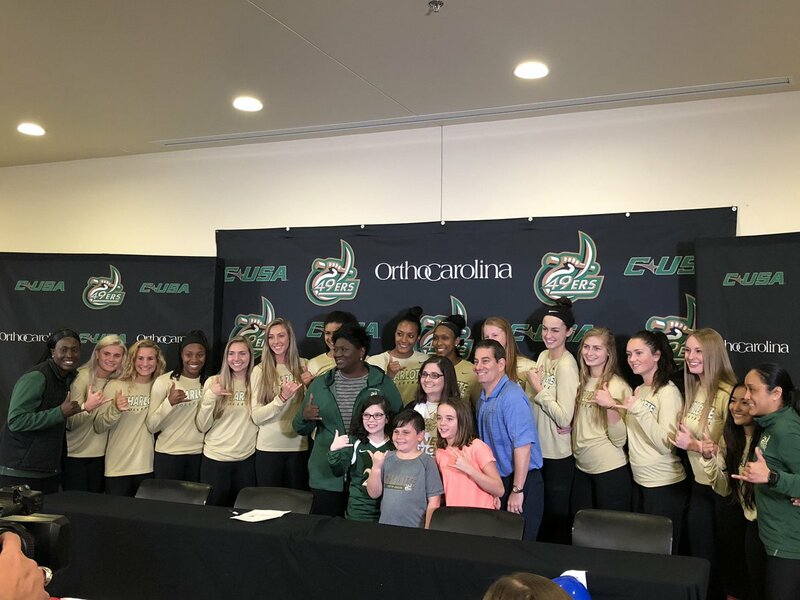 CHARLOTTE, N.C. – The Charlotte 49ers volleyball team will welcome Daniella, a local 10-year-old girl from Matthews, as the newest member of the program on Tuesday afternoon. Daniella, who was diagnosed with Complex Regional Pain Syndrome two years ago, comes to the Niners from Team IMPACT. Two years ago over winter break, Daniella started experiencing pain in her foot and doctors couldn’t figure out why. After months of testing, Daniella was diagnosed with Complex Regional Pain Syndrome, a condition which effects the central nervous system and produces pain throughout the body for unknown reasons. Daniella has been to pain management clinics to help her condition, but often times doesn’t know what triggers it. Daniella is a fighter, highly intelligent and a curious young lady. A true “Gryffindor,” she crushes math competitions, goes to STEM camp and is determined to one day work for NASA. Being an incredibly loving and thoughtful 10-year-old, Daniella spends a lot of time donating and giving back. She has donated her hair to Wigs for Kids twice already and recently organized a clothing drive which ended up donating 18 bags of clothes to the local Crisis Assistance Ministry. This inspiring young lady was introduced to Niner Nation on Tuesday, October 23rd with a “press conference” and “signing” at 1:30 p.m. The Niners will welcome Daniella, younger brother Howie and parents Michael and Melissa to a multitude of volleyball events, activities and matches as an official member of the team. After a GREAT session with the media for her press conference, Daniella will grab some lunch and be on the court for a 2:30 practice coming up!